Our services are priced on a custom-quote basis - we discuss your needs with you, determine what you will need in equipment and installation, and provide an estimate in advance. In some cases we may require a percentage of the project cost up front, but we will make that clear in our proposal. Our standard rate is $75 per hour for one guy, $120 for two guys, with a one hour minimum. There is no charge for travel unless you live outside our travel area. See the map below. We will travel within a 35 mile radius of downtown Cedar Rapids at no charge, which is roughly shown by the circle at left. If you're outside that circle, please add $40 per trip. 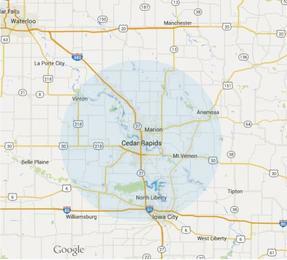 To calculate it exactly, go to Google Maps, enter your address and "Mays Island, Cedar Rapids" and see the distance.